One of the biggest problems I face when I do a multi-day bike tour is that I get numbness in my hands and that is probably due to the hand position in the drops and on top of the handlebars. I visit my doctor and he told me that it probably had to do with the ulnar nerve in my hand is pinched. If there is a bend in your wrist it will cause a pinch in the nerve and your hands will go numb. 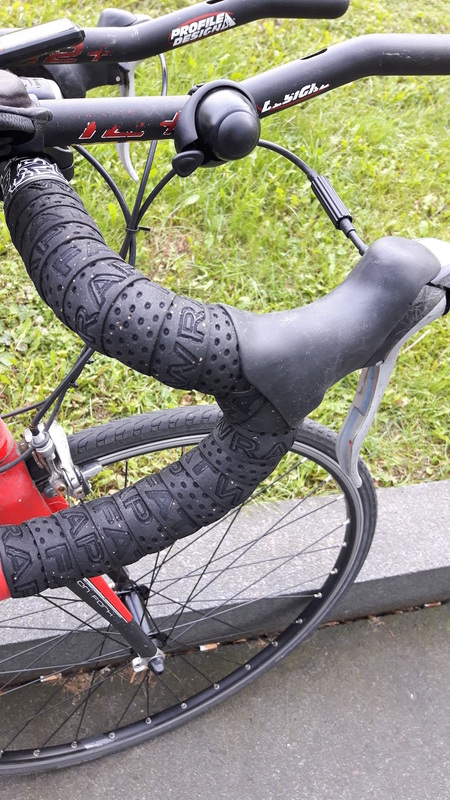 To mediate this problem, I could either try a different type of handlebars that do not make my wrist bend as much or I could try different handlebars tapes. I like my drop down handlebars on my road bike, so I went the direction of finding a handlebars tape that will give me extra cushions and also has the thickness to not bend my wrist too much. I did some research and came across FAT Wrap tape, they claim that the FAT Wrap tape reduces numb fingers and sore wrists on a long tour, and stays grippy and comfy for the long haul. Another option that I could have explored was to double wrap my handlebars, I went with the FAT Wrap tape – got them ship to my address and installed them on my handlebars. I got a two pack, they came nicely packaged. The FAT Wrap tape uses the thickest cork-EVA tape on the market, specifically designed for multi-day bike touring. Since I have got the FAT Wrap tape installed on my bike, I been out on long single day ride up to 200 km, and I notice a reduced numbness in my hands, so it is working. I need to do more multi days rides to see how it works for days after days on the bike. That will come in spring as winter is starting coming to my current residence. A few things that I noticed, I like the thickness of the FAT Wrap tape, it gives me a good cushion to hold my hands on the handlebars. The grip is good, I tried it on a rainy day and the grip was still good. If you are looking for reducing your numbness in you hand you should try out the – FAT Wrap tape.